The President of Mozambique, Felipe Jacinto Nyusi, has stressed the need for intensified Economic cooperation between Ghana and Mozambique. This, he believes will boost ties in the areas of energy, infrastructure development, agriculture, and also deepen cultural ties between the two countries. He expressed his admiration for the progress Ghana has made in the sphere of governance, and looked forward to Ghana sharing its experiences with Mozambique. President Nyusi made the call when Mr. Eric Odoi-Anim, Ghana’s Ambassador to Zimbabwe with Concurrent Accreditation to Mozambique, presented his Letters of Credence to him in Maputo, Mozambique. He recalled Ghana’s credentials as a torch-bearer in the struggle against Colonialism which resulted in the attainment of political independence by most African countries. The Mozambican President also called on Ghana to consider setting up a Resident Mission in Maputo. Mr. Odoi-Anim on his part said the present Global Economic outlook calls for closer Economic co-operation, including the expansion of trade links between African countries for mutual benefit. 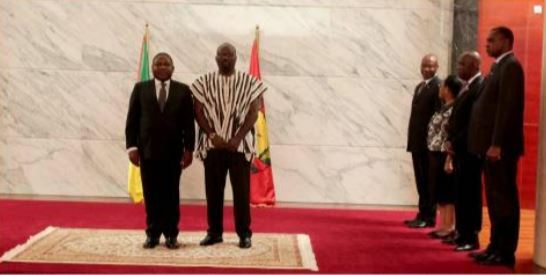 He called for increased trade between both countries, and pledged to accelerate work on the Joint Technical Committee between the two countries which will be a precursor and an essential building block for the establishment of a Permanent Joint Commission on Co-operation between Ghana and Mozambique. Ghana’s Ambassador called for educational exchanges and research collaboration between institutions of higher learning and research in both countries. He said Ghana is looking forward to sharing its experiences in governance with Mozambique, and that the Ghana Mission will work towards promoting co-operation between the various arms of government in Ghana and Mozambique. Mozambique is the only member country of the Commonwealth, which was not a former British Colony.